BOJ (JEN & BON SAUNDERS ) AND RYAN FERRY! 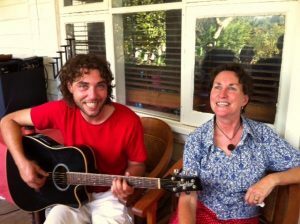 The Dish and Spoon is fast becoming Nowra’s go to venue, and on Feb 15 they are dishing up a night of shimmy and shake! An “expanded” dance floor for the night, with food out on the verandah and the back area, cold beers and wine.. (over 18 event). 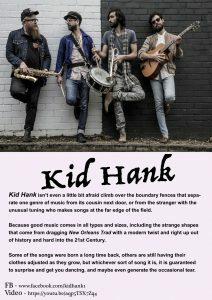 Doors open at 6PM for dinner and bevies….There will be TWO acoustic sets, with Ryan Ferry and BOJ, to start the night at 6:15, and then a set from KID HANK, just to get into highway mode, and then the HORSE DRAWN CADILLAC…. 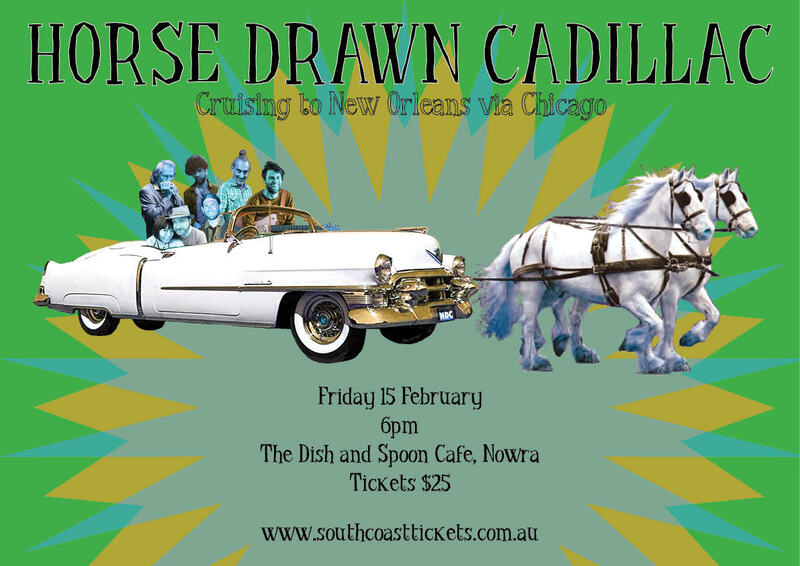 Horse Drawn Cadillac– feel like heading to New Orleans via Chicago on a bump n roll ride with some high octane horses? If you were at their debut Tomerong gig, or the Bamarang boogie, then you know that the band has come to help you party! HDC is ‘Benji and The Salt Water Sound System’s alter ego, giving the band a chance to rock the house with some favourite blues standards and hidden treasures from the deep vault of musical treasures from these great cities. Built for all on the floor! The band : Jono Dallimore and Ben Fowler on guitars, Simon Milman on bass, Mic Elderfield on sax and Nello on Mississipi saxophone, Jayda Tham adding some vocals and Will van Ekert from the Low Down Riders driving the caddy down the road. 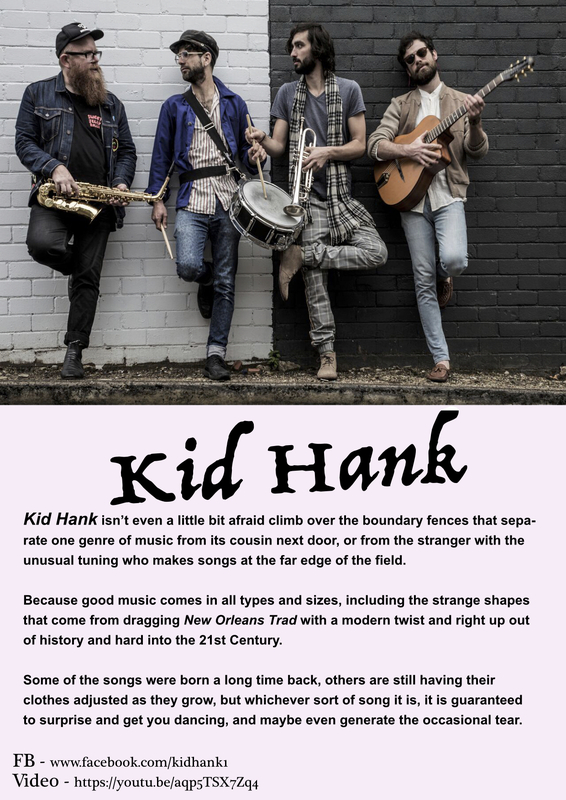 KID HANK isn’t even a little bit afraid to climb over the fences that seperate one genre of music from it’s cousins next door, or from the stranger with the unusual tuning that makes songs at the far edge of the field. Because good music comes in all shapes and sizes, including the strange shapes that come from dragging New Orleans Trad with a strange twist and right up out of history, hard into the 21st century. Some of the songs are from a long way back, and some are still having their clothes adjusted as they grow, but whatever sort of song it is, it will surprise you, get you dancing, and maybe even generate the occasional tear. BOJ are Jen and Bon Saunders, playing the blues like they swam in it first thing this morning.